In order to facilitate the development of new applications and to encourage more innovation in the embedded market, Advantech has created a unique, secure and stable boot loader for our ARM-based products. 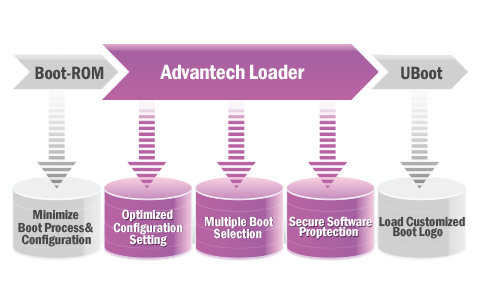 Unlike traditional boot loader structure, Advantech loader offers more add-on value like configuration settings, boot selection and also the capability of integrating more security features and tools for developing more intelligent solutions. Advantech loader is a remarkable creation that redefined the function of a boot loader. To deliver excellent reliability, performance and compatibility, we provide optimized firmware code for corresponding hardware in all Advantech ARM based products, so customers can just focus on application software development and optimized hardware configuration. To enhance flexibility, Advantech offers a pre-installed boot up architecture to automatically search for bootable devices without any boot code modification. The default auto-boot sequence is from SATA drive to SD card to e.MMC, but users can easily configure different devices as primary storage for their applications. Our boot selection architecture can help define system recovery methods and enhance product maintenance. To protect the software application inside your flash memory from being plagiarized, Advantech boot loader supports customized security features and implements special tools to perform authority checks through password and authority keys. Unlike a traditional boot sequence, Advantech loader can interrupt the boot sequence and run a security tool to check if the user is authorized and the software application is licensed. The tool can block the user from entering the OS if the authorization fails, so that it helps secure the system and its applications. Advantech loader is programmable, customizable and upgradable; it is a unique and critical feature for secure application software development.